Choose the wrong baby bouncer and you could end up with a baby screaming his head off rather than snoozing to a lullaby. That’s not a scenario you’d want to impose on new parents or yourself. If you’re in the market for one of those fun contraptions that keep babies happy in their first year of life, we have some ideas for you. Cheapest may seem like a good way to go at first, but baby bouncers include all sorts of bells and whistles to soothe even the most colicky, and that may make a higher priced one worth it. Then again, your little one may be happy with the bare minimum and may not need 10 different songs and 5 different vibrations to stay occupied. 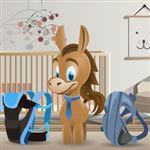 Taking into account the whims and cranky levels of babies and the many bouncers on the market, CreditDonkey rated the top ones to help you decide where to plop and — more importantly — soothe your child. Feeding, bathing, and diapering a baby doesn’t come cheap but add car seats, cribs, baby bouncers, and toys to the mix, and raising a newborn to the toddler stage can be downright expensive. Many parents will insist that a baby bouncer is a lifesaver, but it does come at a cost. They come in an array of prices from the inexpensive (think $40) to the super pricey (think $250+). It’s important to remember when purchasing a baby bouncer that your baby isn’t going to be in the bouncer seat forever. As soon she starts crawling, her interest in a sedentary life is pretty much over. One of the most tantalizing aspects of a baby bouncer is the ability to move it from room to room so you can actually take a shower, fold some laundry, or get other chores done. But if the bouncer is too heavy or clunky, it’s going to limit your, and the baby’s, movement, which is why you want to go with a lightweight one that you can easily maneuver. Comfort is another key factor to consider. Not only do you want one that is soft and itch-free, but you want one that will support your baby’s head and body in different positions. Most baby bouncers on the market come with newborn insets to give your baby necessary support that you can adjust later, and others are geared toward the older set and are appropriate only when a baby can hold up his own head. The ability to easily take the fabric off the seat and throw it in the washer is also major plus, especially when there’s a spit up or diaper accident. Let’s be honest: The whole idea behind a baby bouncer is to soothe and keep your baby distracted so you can get something done. While it’s not going to provide hours on end of entertainment for your baby, if it has the right number of songs, movements, and lights you should be able to get a decent break. 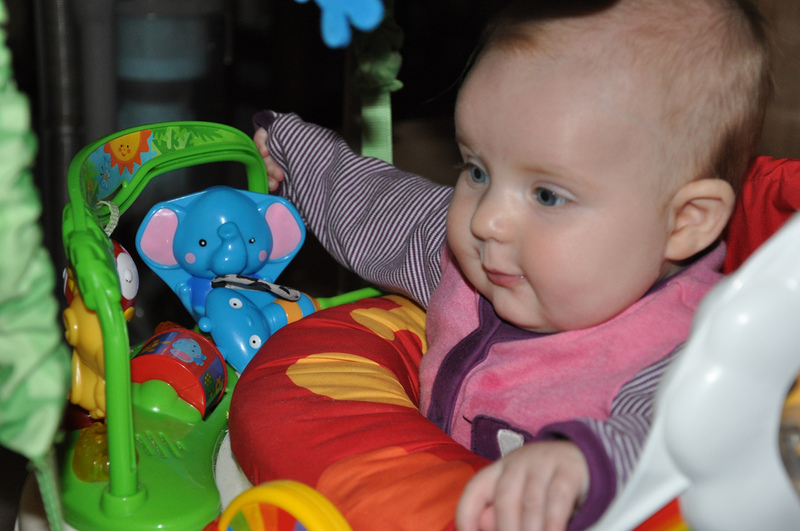 We rated each of those four factors to give you CreditDonkey’s top 3 baby bouncer seats. The Cadillac of baby bouncers, the 4Moms Mamaroo has all the bells and whistles you can imagine. What makes this expensive (but worthwhile) bouncer so impressive are the 5 different motions you can choose from. Not only does it bounce up and down, it sways from side to side, mimicking the movement parents use to comfort their babies. What Others Have Said: Coming in third in SheKnows.com’s 2012 Swings & Bouncers Parenting Awards category and first in its 2011 Top Soothers category, editors liked the “natural movements” of the Mamaroo and its MP3 compatibility. Why We Like It: Applying robotics technology to baby products, 4Moms has won accolades for its innovative and unique designs, and that isn’t lost on the Mamaroo. The 5 movements include the feeling of a car ride, which will save you some gas when baby gets fussy, and a swinging motion so you could skip having to get a separate swing. You have the option of putting on your own music — not some high-pitched generic song that the cheaper bouncers offer — with the MP3 player option. And you can control the bouncer from your Apple device. The fabric is removable for washing. The Downsides: This baby bouncer is not cheap and doesn’t collapse like the other ones for easy storage or travel. It is small and light enough to move from room to room, however. It doesn’t come with the infant insert, which will set you back another $29.99. Who It Works Best For: Colicky babies that aren’t easily distracted and high-tech parents who can afford it. Parents want options and the Tiny Love 3-in-1 Rocker Napper gives them just that. It has 3 positions that let baby nap, recline, or sit up and take in the view. The adjustable arm gives baby access to hanging musical toys, whether he is 1 month old or 6 months old. What Others Have Said: Bestowed as a “best toy” by mommy website Babble, the Rocker Napper has been recommended for its multitasking abilities. Why We Like It: Not only is the baby bouncer affordable, but it also grows with your baby, ensuring you can use it for the roughly 6 months baby will need it. Regardless of the position, the bouncer still rocks your baby while the raised sides give your baby a safe environment. The nifty adjustable arm for the musical toys ensures your baby won’t be swatting at the air or, worse, screaming in frustration. Lightweight enough to easily move around the house, this bouncer has 2 vibration levels, plays music, includes a safety belt, and can easily be cleaned by tossing the pad in the washing machine. The Downsides: This baby bouncer doesn’t have some of the bells and whistles that the Mamaroo offers. There is no built-in speaker nor can you control its movements from your iPhone. It only offers a rocking movement and 2 vibration levels. Who It Works Best For: Ideal for parents who don’t want to shuffle the baby from bouncer seat to bassinet at nap time. The middle reclining position is good for babies with reflux. A player in the children’s product market for decades, Fisher-Price is known for churning out award-winning products, and the Rainforest Jumperoo isn’t an exclusion. It is a must-have for anyone who has an active baby and wants to ensure they have a safe environment in which to play, jump, and stay stimulated. What Others Have Said: A number one best seller on Amazon.com, reviewers applaud the array of toys, comfort, and length spent in the bouncer. Parents magazine said it’s a key product for getting time to make a meal or take shower. Why We Like It: Not only does the Rainforest Jumperoo let your baby spin 360 degrees, giving her a view from every vantage point, she also gets a host of activities such as a monkey she can hit, a lizard she can shake for sound, and a drum she can spin. The Rainforest Jumperoo adjusts to 3 heights, which means it can grow with your child, and the seat pad is easy to take off and put on for quick washing. The Downsides: The Rainforest Jumperoo is a bit bulky, which means it’s tough, but not impossible, to move around the house. As your child becomes more wiggly, it may become more challenging to slider her legs into the seat holes. Who It Works Best For: Any baby who is active or who likes to jump. The multiple activities are great for parents who need to buy some time. Unlike the other products above, this one is not useful for newborns. If cost is a major factor, there are a slew of lower cost bouncer seats that you should consider. Fisher-Price Rainforest Friends Deluxe Bouncer costs under $50 and offers a couple of sounds and vibrations, while the Bright Starts Playful Pals Bouncer will set you back $30. Share on Facebook "Best Baby Bouncer"